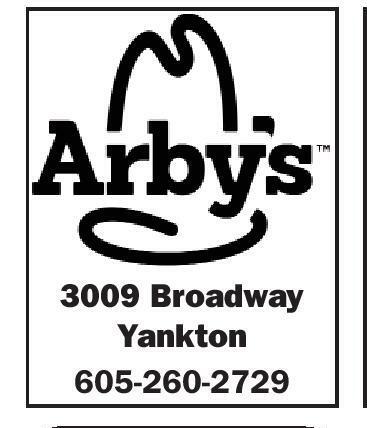 PAGE 2: SPRING SPORTS 2018 PRESS & DAKOTAN ? PLAIN TALK Cover Story YHS Hurdlers Ready To Take The Next Step other to be better. “I’m pretty competitive. My goal every meet is progress, but also to beat her,” A season ago, Kate Budig Budig said. “Even in practice, and Kelsey Oswald were the we race each other to make “first two out” of the finals of each other better. We know the Class AA girls’ 100-meter each of us can do better, and dash finals. Both qualified we use each other for that.” for state in the 300-meter While the two have hurdles, and missed those different personalities and finals as well. backgrounds, they have a lot This year, with that of similarities, Lukkes noted. experience and another year “They are both very of maturity, the senior Budig coachable,” he said. “They and the sophomore Oswald are very hard workers, very look to comfortably put competitive. They are also themselves in both finals. 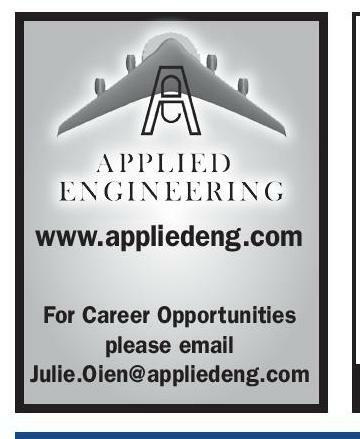 good leaders.” “The goal for both of them Budig has taken the leadis to be top contenders in ership mantel held by Tessier both the 100 and 300,” said in recent years. Yankton hurdles coach Cody “Tess was a really good Lukkes. leader for us, and Kate has The two prepared for picked up the reins,” Oswald the season in different ways said. “Kate has done a rebefore practice began. ally good job of filling Tess’ Budig did individual shoes.” workouts with a local trainer While Budig misses having in addition to dance. Tessier to lead the way, she is “I’m pretty busy with doing her best to share what dance in the winter. That she learned. helps me stay in shape,” said “There are a lot of tradiBudig, who also competes in tional things, things we do in volleyball at YHS. 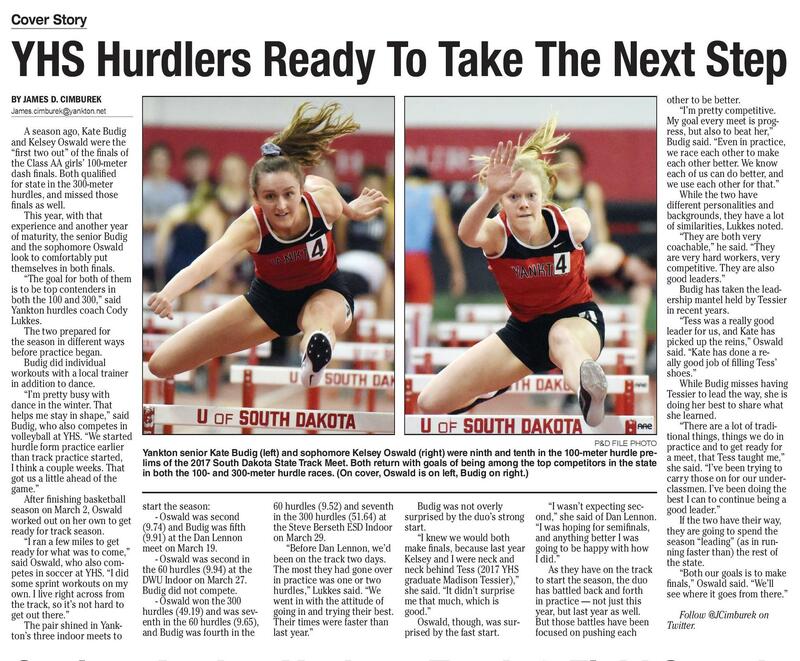 “We started P&D FILE PHOTO practice and to get ready for hurdle form practice earlier Yankton senior Kate Budig (left) and sophomore Kelsey Oswald (right) were ninth and tenth in the 100-meter hurdle pre- a meet, that Tess taught me,” than track practice started, lims of the 2017 South Dakota State Track Meet. Both return with goals of being among the top competitors in the state she said. “I’ve been trying to I think a couple weeks. That in both the 100- and 300-meter hurdle races. (On cover, Oswald is on left, Budig on right.) carry those on for our undergot us a little ahead of the classmen. I’ve been doing the game.” best I can to continue being a After finishing basketball start the season: 60 hurdles (9.52) and seventh Budig was not overly “I wasn’t expecting secgood leader.” season on March 2, Oswald - Oswald was second in the 300 hurdles (51.64) at surprised by the duo’s strong ond,” she said of Dan Lennon. If the two have their way, worked out on her own to get (9.74) and Budig was fifth the Steve Berseth ESD Indoor start. “I was hoping for semifinals, they are going to spend the ready for track season. (9.91) at the Dan Lennon on March 29. “I knew we would both and anything better I was season “leading” (as in run“I ran a few miles to get “Before Dan Lennon, we’d make finals, because last year going to be happy with how ning faster than) the rest of ready for what was to come,” meet on March 19. - Oswald was second in been on the track two days. Kelsey and I were neck and I did.” the state. said Oswald, who also comThe most they had gone over neck behind Tess (2017 YHS As they have on the track “Both our goals is to make petes in soccer at YHS. “I did the 60 hurdles (9.94) at the in practice was one or two graduate Madison Tessier),” to start the season, the duo finals,” Oswald said. “We’ll some sprint workouts on my DWU Indoor on March 27. Budig did not compete. hurdles,” Lukkes said. “We she said. “It didn’t surprise has battled back and forth see where it goes from there.” own. I live right across from - Oswald won the 300 went in with the attitude of me that much, which is in practice — not just this the track, so it’s not hard to hurdles (49.19) and was sevgoing in and trying their best. good.” year, but last year as well. Follow @JCimburek on get out there.” enth in the 60 hurdles (9.65), Their times were faster than Oswald, though, was surBut those battles have been Twitter. The pair shined in Yankand Budig was fourth in the last year.” prised by the fast start. 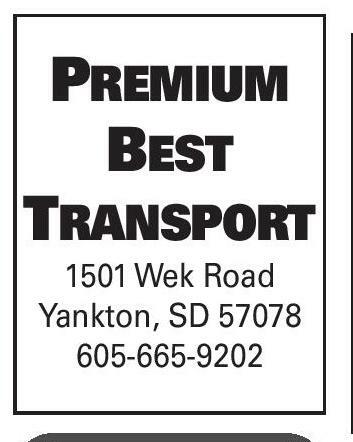 focused on pushing each ton’s three indoor meets to BY JAMES D. CIMBUREK James.cimburek@yankton.net Seniors Anchor Yankton Track & Field Squads and helping, instructing,” Youmans said. “Those are things that, as a coach, I can’t do. 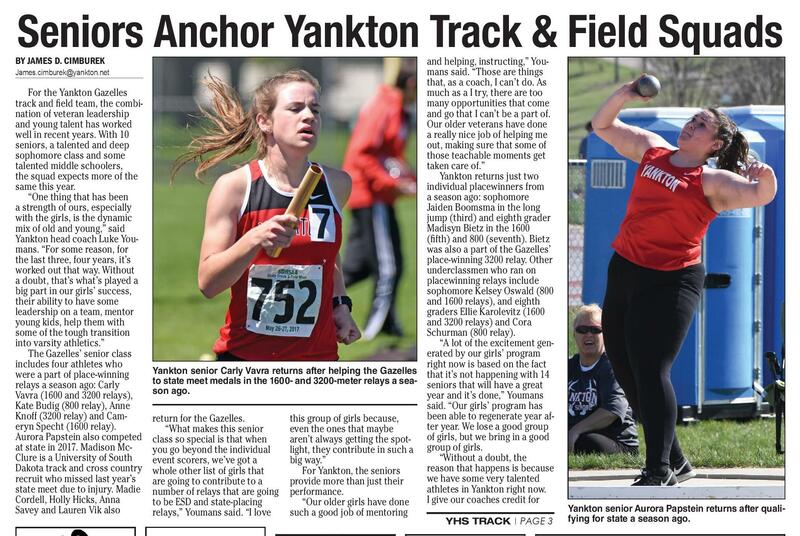 As much as a I try, there are too For the Yankton Gazelles many opportunities that come track and field team, the combiand go that I can’t be a part of. nation of veteran leadership Our older veterans have done and young talent has worked a really nice job of helping me well in recent years. With 10 out, making sure that some of seniors, a talented and deep those teachable moments get sophomore class and some taken care of.” talented middle schoolers, Yankton returns just two the squad expects more of the individual placewinners from same this year. a season ago: sophomore “One thing that has been Jaiden Boomsma in the long a strength of ours, especially jump (third) and eighth grader with the girls, is the dynamic Madisyn Bietz in the 1600 mix of old and young,” said (fifth) and 800 (seventh). Bietz Yankton head coach Luke Youwas also a part of the Gazelles’ mans. “For some reason, for place-winning 3200 relay. Other the last three, four years, it’s underclassmen who ran on worked out that way. Without placewinning relays include a doubt, that’s what’s played a sophomore Kelsey Oswald (800 big part in our girls’ success, and 1600 relays), and eighth their ability to have some graders Ellie Karolevitz (1600 leadership on a team, mentor and 3200 relays) and Cora young kids, help them with Schurman (800 relay). some of the tough transition “A lot of the excitement geninto varsity athletics.” erated by our girls’ program The Gazelles’ senior class right now is based on the fact includes four athletes who Yankton senior Carly Vavra returns after helping the Gazelles that it’s not happening with 14 were a part of place-winning to state meet medals in the 1600- and 3200-meter relays a sea- seniors that will have a great relays a season ago: Carly son ago. year and it’s done,” Youmans Vavra (1600 and 3200 relays), said. “Our girls’ program has Kate Budig (800 relay), Anne been able to regenerate year afKnoff (3200 relay) and Camreturn for the Gazelles. this group of girls because, ter year. We lose a good group eryn Specht (1600 relay). “What makes this senior even the ones that maybe of girls, but we bring in a good Aurora Papstein also competed class so special is that when aren’t always getting the spotat state in 2017. Madison Mcyou go beyond the individual light, they contribute in such a group of girls. 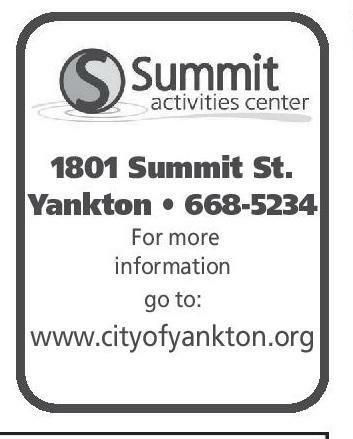 “Without a doubt, the Clure is a University of South event scorers, we’ve got a big way.” reason that happens is because Dakota track and cross country whole other list of girls that For Yankton, the seniors we have some very talented recruit who missed last year’s are going to contribute to a provide more than just their athletes in Yankton right now. state meet due to injury. Madie number of relays that are going performance. I give our coaches credit for Cordell, Holly Hicks, Anna to be ESD and state-placing “Our older girls have done Savey and Lauren Vik also relays,” Youmans said. 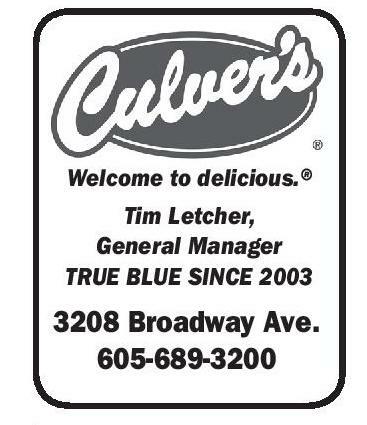 “I love such a good job of mentoring BY JAMES D. CIMBUREK James.cimburek@yankton.net YHS TRACK | PAGE 3 PREMIUM BEST TRANSPORT 3009 Broadway Yankton 605-260-2729 Welcome to delicious.® Tim Letcher, General Manager TRUE BLUE SINCE 2003 3208 Broadway Ave. 605-689-3200 1501 Wek Road Yankton, SD 57078 605-665-9202 1801 Summit St. Yankton • 668-5234 For more information go to: www.cityofyankton.org Yankton senior Aurora Papstein returns after qualifying for state a season ago. 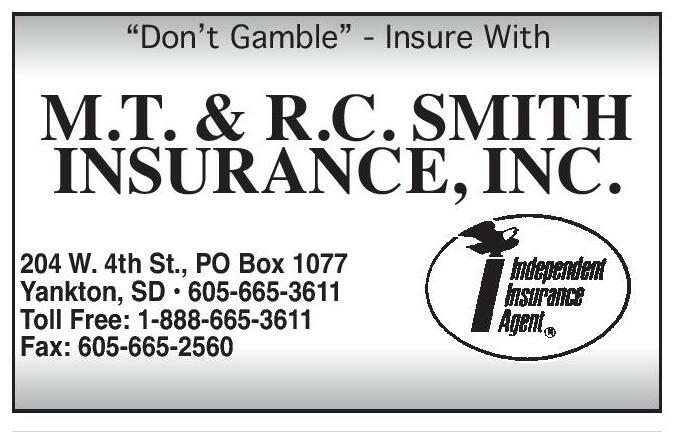 “Don’t Gamble” - Insure With M.T. & R.C. 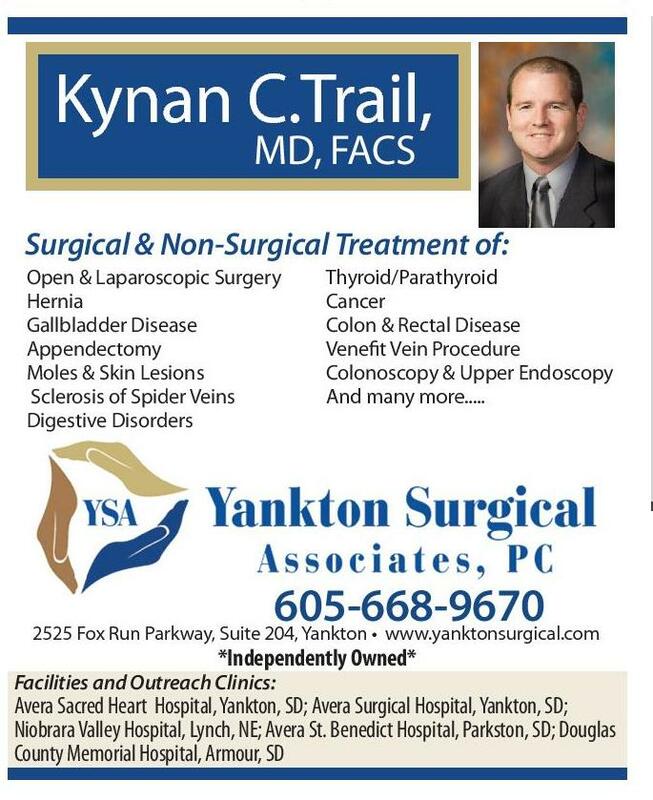 SMITH INSURANCE, INC. www.appliedeng.com For Career Opportunities please email Julie.Oien@appliedeng.com 665-1902 2100 Broadway, Yankton Mall Daily Lunch Specials Kynan C.Trail, MD, FACS Surgical & Non-Surgical Treatment of: Open & Laparoscopic Surgery Hernia Gallbladder Disease Appendectomy Moles & Skin Lesions Sclerosis of Spider Veins Digestive Disorders Thyroid/Parathyroid Cancer Colon & Rectal Disease Venefit Vein Procedure Colonoscopy & Upper Endoscopy And many more..... 605-668-9670 2525 Fox Run Parkway, Suite 204, Yankton • www.yanktonsurgical.com *Independently Owned* Facilities and Outreach Clinics: Avera Sacred Heart Hospital, Yankton, SD; Avera Surgical Hospital, Yankton, SD; Niobrara Valley Hospital, Lynch, NE; Avera St. Benedict Hospital, Parkston, SD; Douglas County Memorial Hospital, Armour, SD 204 W. 4th St., PO Box 1077 Yankton, SD • 605-665-3611 Toll Free: 1-888-665-3611 Fax: 605-665-2560 Our Team is Here for You. 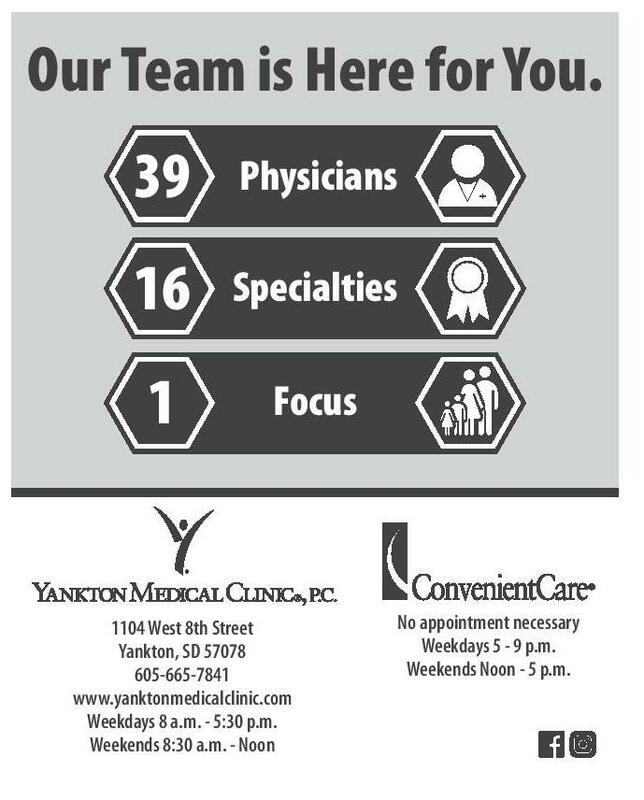 39 Physicians 16 Specialties 1 Focus 1104 West 8th Street Yankton, SD 57078 605-665-7841 www.yanktonmedicalclinic.com Weekdays 8 a.m. - 5:30 p.m. 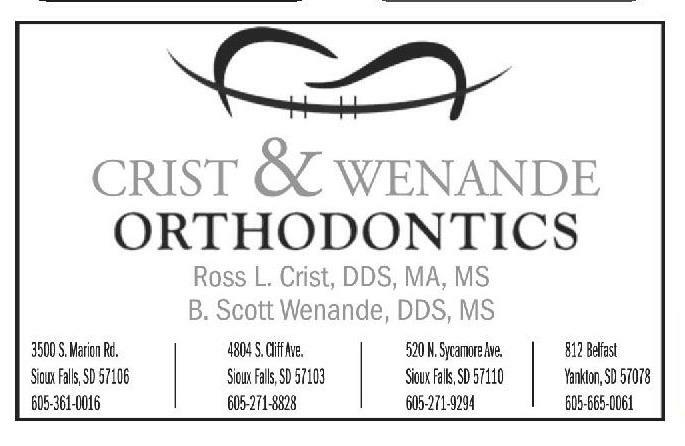 Weekends 8:30 a.m. - Noon No appointment necessary Weekdays 5 - 9 p.m. 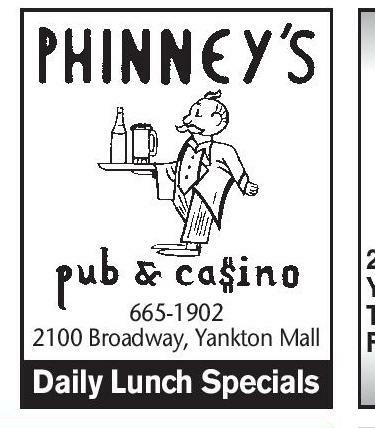 Weekends Noon - 5 p.m.